“Those who are sickly you have not strengthened, the diseased you have not healed, the broken you have not bound up, the scattered you have not brought back, nor have you sought for the lost; but with force and with severity you have dominated them” (Ezekiel 34:4). This Scripture applies to many church leaders who use threats in order to control their congregations. It also applies to pastors who preach righteousness but fail to do their best to walk in righteousness and help those in need. Finally, I believe this Scripture can apply to the parent-child relationship as so many times children’s needs go unmet, and their immature ways of trying to communicate their needs are punished. Some parents would rather dominate their children with force and severity rather than connect and guide them. 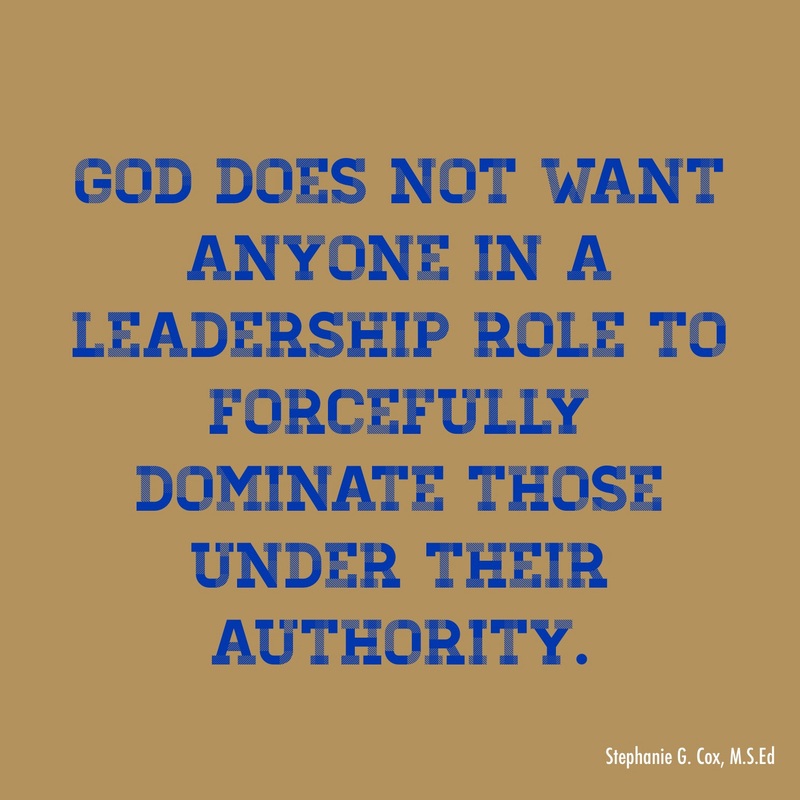 God does not want anyone in a leadership role to forcefully dominate those under their authority. During our worship time this morning, my husband and I heard a gospel song talking about a dad who wanted to follow Jesus because his young daughter was now following him. The song made me cry as I pictured a line of Jesus, the dad, and a small girl closely following each other. Perhaps holding hands and smiling at each other as they walked along. It hit me that so many times Christian parents try to lead their children towards Jesus and the path of righteousness from behind. They forcefully push their children down the path. They actually cause their children to veer off the path by spanking/hitting them, ignoring their cries, and sending them to isolation every time the child starts to get off the path. Leaders can’t truly lead from behind. Their followers don’t know which way to go if they are in front of their leaders. Think how scary it would be to not know where you’re going AND every time you made a wrong turn, you got a painful punishment from your leader. Wouldn’t that scare, frustrate, and discourage you? Wouldn’t you get angry and say, “Forget it?” Could you even trust your leader? I imagine that is how many children feel who are raised where their parents lead from behind. Thankfully, our example is Jesus. He leads from the front and side. He knows when to take our hand or gently but firmly put His arm around us when we veer off course in order to get us back on track. When He is behind us, it’s simply to catch us when we fall. Our children need us to lead from the front and side so we can gently set them back on the right path. 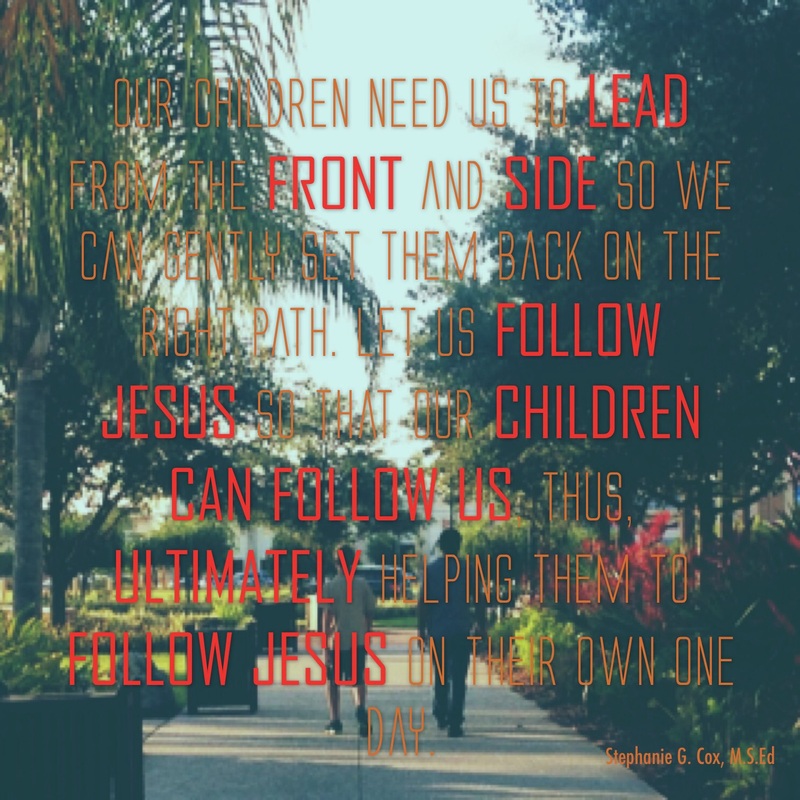 Let us follow Jesus so that our children can follow us, thus, ultimately helping them to follow Jesus on their own one day.